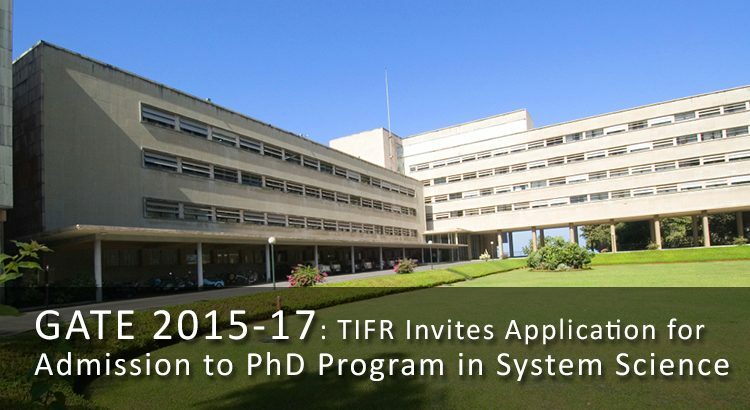 The Tata Institute of Fundamental Research (TIFR), Deemed University, has released a notification inviting applications from B.Tech students with outstanding performance in GATE 2015-2017 exams for admission to PhD program in Systems Science. The GATE score of engineering students in Electrical, Electronics and Communications Engineering, and Mathematics would be the determining factor for admission to the Ph.D. program in Systems Science. The candidates need not to appear for the entrance exam that is conducted by TIFR. However, if a candidate has already taken the TIFR System Science entrance exam then also he can apply on the basis of his GATE score card. In this case, the candidate’s better performance in both the exams would be considered. The candidates whose GATE score card has been shortlisted will be called for the interview in the month of May 2017. The last date for application process for the Ph.D. program is 9 April, 2017. If a candidate wishes to apply on the basis of GATE score, he has to apply online on the official website of TIFR. For GATE score card holders there is no application fee.